Options in India: The Twist in the Tale? Sometimes, the obvious -isn't so obvious!! The last time I felt hugely shortchanged..was a couple of years ago, as I was trying to 'coach' my (then) 8yr old son to play cricket. Having been an ardent fan & follower, and grown up playing 'copybook' cricket-here I was itching to share my wisdom: the use of the right footwork, how one showed the full face of the bat to the ball, the split second decision of when to chose between a front/back foot defence..and the need to 'save one's wicket' for staying as much at the crease. You would be in the game -by 'playing out ' the good deliveries..and wait for the bad ones to hit..., right'? My session didn't even last 5 minutes as my son was quite sure I was crazy! Who ever 'defends' in today's cricket? Every ball was to be hit..and depending on the trajectory -of the swinging bat-they were runs to be scored :)!! The purist coach in me -retired prematurely -almost disgruntled with the ways of modern cricket. Till I started relishing the marvel of today's professional cricket 'fielding coaches' -most certainly Jonty Rhodes & Robin Singh! Their influence on the fitness of the game-has almost taken the onus away from the exploits of the specialists (batsmen & bowlers alike!). With most matches being tight ones these days, it is increasingly the fielders who make the difference- in the end-between the winner & the loser. It is common to see huge men flinging themselves on the ground, rolling, and even when when two converge to the same shot deep in the field, one has the presence of mind to relay the ball to perhaps the one with the stronger arm-to rush it in the 'keepers gloves! Not just saving certain boundaries, even converting the 3's into 2's-and often putting the doubt in the batsmen's mind, the ability to create tension, or even keep the lesser of the batsmen stay put at the striker's position-is as invaluable as the old adage of 'catches win matches'!! In the days to come- I won't be surprised if the score cards start also listing the 'value add' by the fielders-and not just records of the runs scored or the wickets captured-but the 'net' runs contributed. After all, the most time any cricketer spends on the ground-more than the chances to bat or bowl- is while fielding, right? Let me now change track to my lifetime passion!! Fast forward to a webinar I listened to, last fortnight, by Recruiting expert Lou Adler-courtesy Linked in & Adler Group survey Sept 2010, I just sat back and wondered..'why hadn't I thought of this before'?? Super passive : not likely to budge! Wow-doesn't this segmentation totally change the challenges for the recruiter? 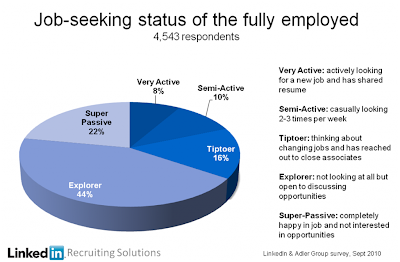 Adler hints that the days of "Sourcing Active Candidates" will have to give way to "Recruiting Passive Prospects". As for those of the 'super passive ' ilk..here is a solution gaining momentum!! Recent reports of "acqhiring", indicative of the hunger for the best talent (Silicon Valley companies trend of buying start-ups & then jettison the product) -seem to validate that " someone who is exceptional in their role is not just a little better than someone who is pretty good; they are 100 times better!!" Are we in the HR fraternity -ready for the twist? ?